US. and Canadian citizens are required to present a passport or a birth certificate with a photo ID to enter the island. All other visitors must present a passport. Visitors may stay for a maximum of six months, but extensions may be requested at the immigration office in Charlestown. Visitors must enter with a return ticket. Departure tax when leaving the island is $20.50 US or $54 EC, which includes an environmental levy and airport security tax. Attention: with new laws taking place all the time, we highly advise you check with your local government, for the required travel documents needed before planning your trip. November 10, 2006. 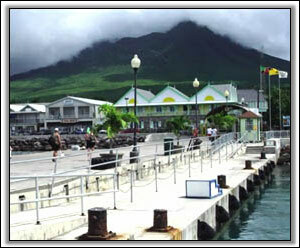 Citizens of some countries are not required to have visas in order to enter St. Kitts – Nevis. Please click here to view the complete list, apply for a visa, or for St. Kitts-Nevis Embassies. The East Caribbean (EC) dollar is used on Nevis which can be obtained at any bank. Most stores and businesses accept the US dollars or traveler’s checks, but change will be given in EC. Neither banks nor stores accept the US coins only paper bills. The exchange rate is fixed at US $1.00 = EC $2.68. In general it is better to use EC to speed transactions, plus it is a very interesting and pretty currency. About 55 stations are available, including pay movie stations such as HBO, Cinemax, The Movie Channel and Disney. Numerous other stations FM and Am from nearby islands. There are a number of different churches on Nevis. Worship services are primarily held on Sundays and Saturdays but some churches do meet during the week for prayer and bible services. Any of the churches warmly welcome visitors. Most hotels, restaurants, and businesses accept credit cards, but it's best to check ahead before relying on just credit cards. Bank ATM machines will give EC funds through some credit cards. The official language of the island is English, though with a strong West Indian dialect. A room tax of 8% and service charge of 10%, and a villa rental tax of 9%. 10% to 15%, depending on the service. Some Nevis restaurants and hotels will automatically add a 10% gratuity. If you are in doubt, do not feel uncomfortable asking. Usually, porters and bellhops receive 50 cents per bag, taxi drivers 10-15% of the fare. The General Post Office, located in Charlestown, is open Monday - Friday 8:00 AM to 3:30 PM. Closed on Saturday and Sunday. Nevis’ modern telecommunications system permits smooth and prompt telephone, facsimile, and Internet connections throughout the world. To make an overseas call, dial 3-5-5 and follow the instructions to making a call using a credit card. Phone cards for use locally or overseas are available through the Cable and Wireless, the telephone company. If at all possible always avoid Cable and Wireless / Skantel long distance operators, they are very expensive, try to reach a ATT operator in the US. Check to see if your cell/mobile phone carrier has service in Nevis. These rates could be much cheaper. UTC / GMT -5 hours - Eastern Standard Time, but does not change for Daylight Saving Time. Drinking water is pure and safe to drink, but if you are sensitive to food and water changes, you may prefer commercially bottled water. Bottled water is sold in stores, restaurants, and hotels. 230 volts, 60 cycles. Most Nevis hotels and Villas have 110 volts, and converters are available. Saint Kitts & Nevis has doctors on call at hotels and a 24-hour Casualty Department. Recompression chambers are available by air ambulance at nearby Saba and in St. Thomas. Pharmaceutical services are widely available. Monday through Saturday 8:00 am to noon and 1:00 PM - 4:00 PM. On Thursdays, most shops close for the afternoon. 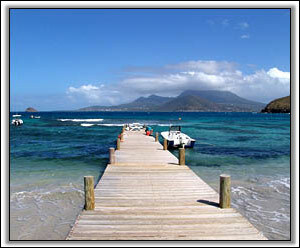 Saint Kitts & Nevis are relatively crime free, but exercise normal precautions. For example, don't leave valuables unattended in rental cars or on the beach. Before taking photographs of residents, it’s respectful to ask their permission. Do this when photographing people, their children, and their personal property, including their homes. Dress for dinner is generally “casually elegant.” Jackets and ties are not required for men at any of the restaurants.